There are only four of these hats known to exist in the entire world, and now I have seen two of them. 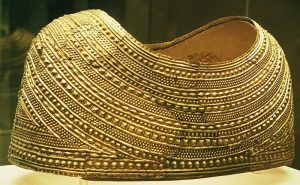 The first gold hat I saw was also the youngest (1,000-800 BCE). 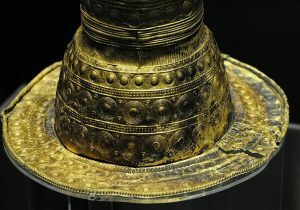 It is is called the Berlin Gold Hat, and it is housed at the Neues Museum in Berlin. 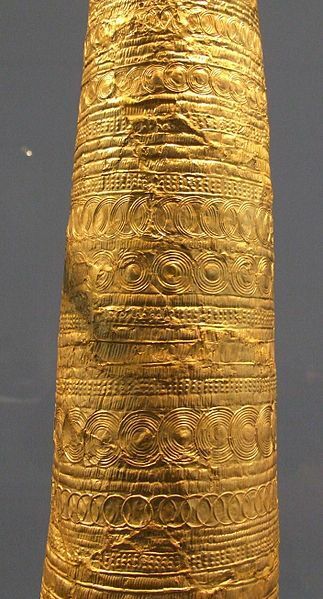 The second gold hat I saw was the oldest (1,400-1,300 BCE). 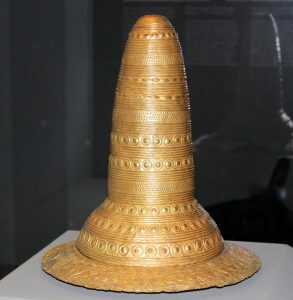 It is called the Golden Hat of Schifferstadt. 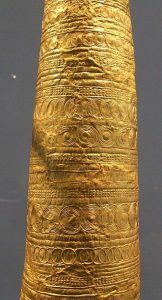 It was found intact in a field just outside of Speyer, and it is housed in the Historical Museum of the Palatinate in Speyer. The similarities between the two hats I viewed were obvious. Two more hats are known to exist. 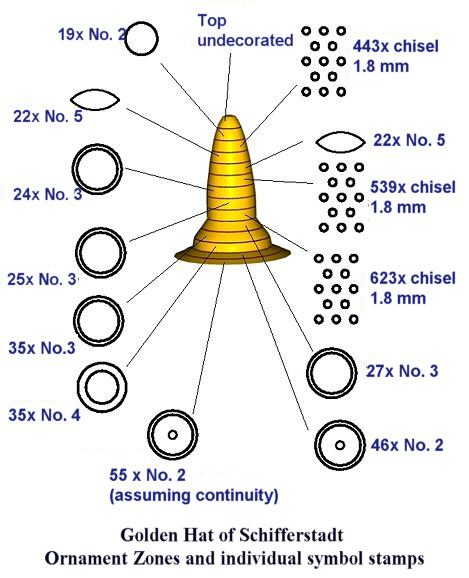 The Avanton Gold Cone, missing its brim, was found near Poitiers, France in 1844, and the Golden Cone of Eseldorf-Buch, found crushed and badly damaged in a field in Southern Germany. The hat found near Speyer has the most interesting history. It was discovered during farm work in 1835 and was apparently buried on purpose. The hat was on a burnt slab of clay when found, and three bronze axes were leaning against the hat. If only the clay material had survived, perhaps we would know more today about the hat’s intended function. What was it used for? Why was something so valuable purposely buried? Almost nothing is known about the hat in the museum in Berlin. 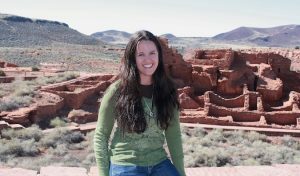 No one knows where it was found, how it was found, or if there were any artifacts found with it. The hat was purchased from a private Swiss collection in 1996. It could have come from France, Southern Germany or Switzerland, but no one knows. It’s a shame too, because the Berlin Gold Hat is the most perfectly preserved, was almost certainly looted from an archaeological site. The information lost when this artifact was removed from its place of origin could have been the crucial piece of the puzzle in solving the mystery of the four gold hats. They mystery does not end with the four gold hats In Germany and France. There is one more artifact that bears a striking resemblance to gold hats. The Mold Cape, found in Wales and the four gold hats look as if they belong together. The cape and hats were all made from a single sheet of gold, and all share a similar pattern of decoration. The cape dates from about 1900-1600 BCE, and the hats date from 1400-800 BCE Despite the time difference between the hats and the cape, the similarities indicate a shared culture and knowledge. 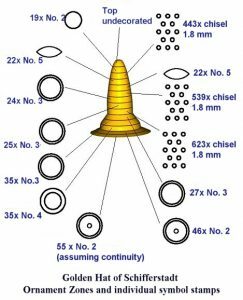 A 2002 article from the London Telegraph describes the gold cones as “hats of ancient wizards.” At first this may sound ridiculous but when you examine the possible function of the hats, the “wizard” label starts to make sense. 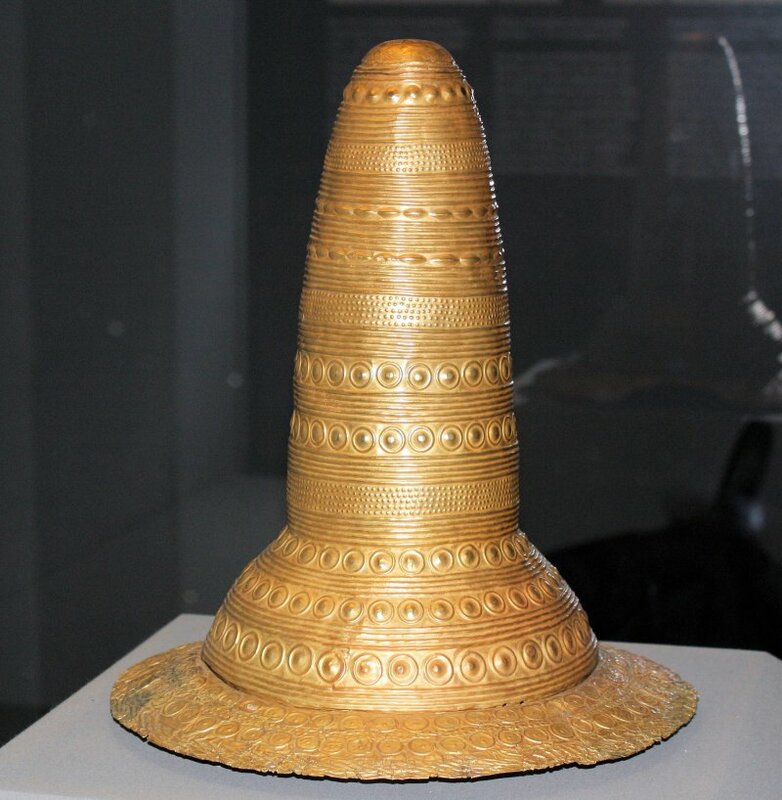 At first the hats look like mere decoration, or maybe even ceremonial objects, and that is precisely what they were thought to be until recently. 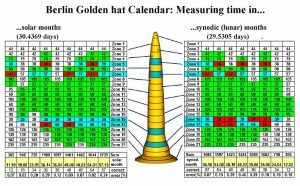 Now, researchers think that the gold hats, and especially the Berlin gold hat, served as lunar and solar calendars. 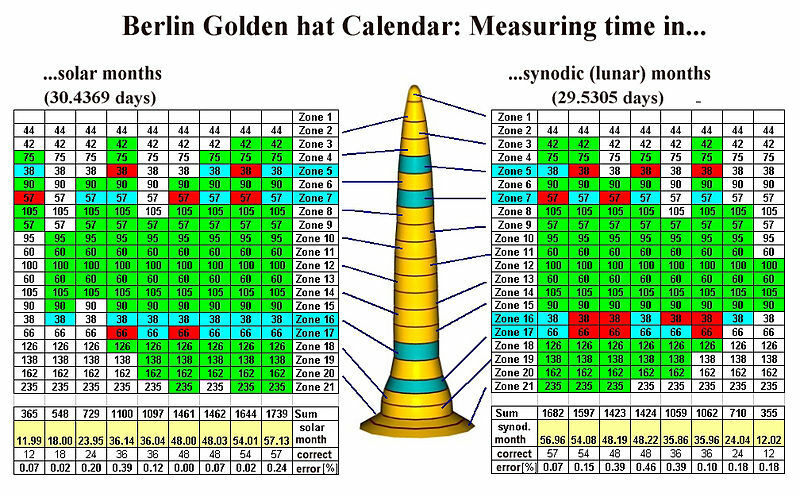 It has been calculated that the Berlin Gold Hat displays a period of up to 57 months. So if this theory proves valid, then calling those wearing or using the hats “wizards,” is appropriate. What else would one be called in the Bronze Age, but a wizard, who could demonstrate a knowledge of periods of time, seasons, and lunar, and solar cycles? The question remains, where did the “wizards” of the Bronze Age obtain this knowledge?